Good Weather has made his trainer Richard Butler work overtime from day one. The lightly raced four-year-old hasn’t made the job of crafting a racehorse an easy one but Butler is clearly winning the battle and they will chase successive city wins at Warwick Farm on Wednesday. 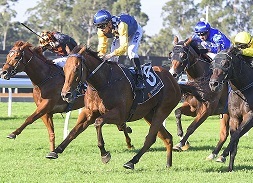 Good Weather chases successive Warwick Farm wins on Wednesday. (Pic: Bradley Photos). "I got him as a two-year-old, untried, and I knew from the first time I rode him I could feel some promise but he was difficult to ride for the first three weeks,'' Butler, 38, said. Like a lot of horses that come through his Nowra stable, Good Weather was bound for Hong Kong but he failed the vet checks required. Butler, who has three horses in work, is in his fifth season of training and was allowed to retain the gelding by his owner with a small caveat. "They told me if he didn’t place in his first four starts he’d be going to another trainer,'' he said. "He hasn’t been out of the top four in seven runs to date so I’m very lucky. Good Weather gave Butler his first city winner last month and he returns to the scene of that victory in the Exosphere Standing At Darley Handicap (1300m). On the back of a solid first-up run in a small field at Hawkesbury, Good Weather started $15 last start and will go around underestimated again with TAB offering a similar quote. In a fast run race, Good Weather sat just on the back of the speed and ran home in 35.81 which was the second fastest of that race according to Punters Intel. "I went to Warwick Farm confident the horse would run a good race but it surprised me that he did win,'' he said. "It was my first city winner and the thrill I got from that is unbelievable. "I’m sure he’ll turn up and put in a similar effort as he’s done in his seven starts. Jockey Adam Hyeronimus is on board for the fourth time and Butler revealed he's had a long friendship with the talented rider. That association made the horse’s city breakthrough even more memorable. "Having Adam ride helps my mind knowing that he’s in good hands,'' he said. "I first met Adam when he started his apprenticeship and he used to ride a lot of the horses I broke in.